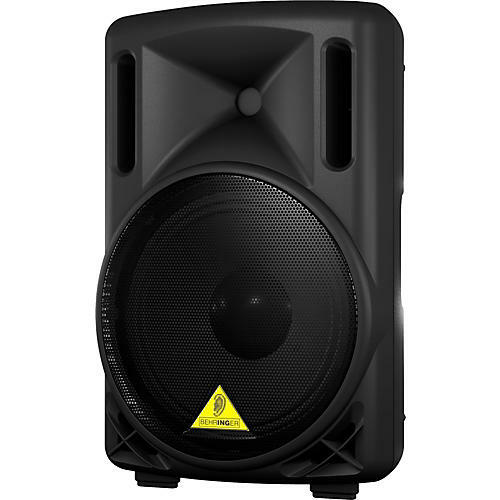 Like its fellow EUROLIVE D Series loudspeakers, the EUROLIVE B210D PA speaker system features Behringer's special Class-D amplifier technology and internal switch-mode power supply to provide a much better power-to-weight ratio than other active speakers. Due to the high-efficiency design, the BEHRINGER EUROLIVE B210D speaker system cranks out 220 of the cleanest, punchiest audio Watts you've ever heard from a compact PA system. The integrated sound processor provides total system control, along with dependable protection of the LF and HF transducers, thanks to the built-in active high-pass filter, which virtually eliminate distortion-even at extreme operating levels. In addition, it features an Ultra-Low Noise (ULN) Mic/Line input with LEVEL control and a dedicated 2-band EQ (bass/treble) for easy control. One of the coolest things about active speakers is the lack of backbreaking racks of amps, crossovers, and EQs that are often required to make passive speaker systems sound almost as good. But that comes with a trade-off‚Äîthat extra weight is transferred to the loudspeaker, making it difficult for a single user to heave all that mass onto the top of a speaker stand. BEHRINGER's EUROLIVE D Series' "Intelligent-Design" merges the best features of active loudspeakers with significantly lower weight by using switch-mode power supplies and Class-D amplifier topology. Hidden deep inside the enclosure is the equivalent of an active 2-way electronic crossover, graphic EQ, parametric EQ, mic preamp, limiter, and two Class-D power amplifiers, yet the overall weight is less than a comparable loudspeaker system. These components work together seamlessly to provide optimum sound quality-and it all takes place automatically, without you having to touch a single knob. Instead of operating relatively continuously like Class AB circuits, Class D amps switch on and off thousands of times per second, delivering power only when needed. In other words, the amplifier is either fully on or fully off, which significantly reduces the power losses in the output devices. This is easy in theory and complex in practice, which is why there are so many different Class D designs. Without boring you with terms like PWM Generation and Gate Drivers, let's just say that to realize the benefits of a Class D design requires compensating for a lot of potential problems that can cause audible distortion. BEHRINGER didn't invent Class D technology, but their R&D department has been working for years to perfect their own version with all the benefits of reduced weight and cool running, yet without the drawbacks. That's why they invested over a solid year of research time eliminating pitfalls in their PA system like quantizing errors and excess dead time, selecting just the right switching frequency (and other equally tech-y terms). It's also why they spent an equally long time testing individual components to ensure they will stand up to the rigors of the real world. When combined with switching-mode power supplies that replace heavy toroid transformers, these new designs provide more dynamic punch since the higher switching frequency reloads the supply's capacitors much faster. And, because they are so much more efficient, the D Series loudspeakers run cooler and don't require huge and heavy heat sinks. The resulting speakers systems are much lighter, making them easy to transport and set up. BEHRINGER's no-compromise design means your EUROLIVE B210D active loudspeaker will deliver full power and incredible fidelity all night long, with no need for rest cycles. With just a single EUROLIVE B210D PA speaker system and a microphone or MP3 player, you can set up an instant sound system. Thanks to the built-in preamp section, you just connect a dynamic mic and raise and lower the volume with the Level control. Plug in your sound source, place the speaker on a tabletop or stand, and power up. It's just that easy. And if you need more coverage, simply use the convenient LINK OUTPUT XLR connector to add more active loudspeakers. You can use two EUROLIVE B210D enclosures for stereo playback of your MP3, CD, or old-school cassette deck without any additional hardware. Just plug the appropriate stereo breakout adapter into your deck's output jack and run the cables to the 1/4" inputs on each loudspeaker. Set the Level and EQ controls the same on both enclosures, and you've got an instant party. Thanks to their trapezoidal design, the D Series cabinets can be laid on their side providing the ideal angle for onstage monitor wedge applications. Hookup is simple too, requiring only a single XLR or 1/4" cable from the monitor send on your mixing console and, of course, power. Additional monitors can be chained together via the XLR LINK OUTPUT jack on the rear panel. The transducers (woofers and tweeters) are the only part of a sound system you actually hear, so BEHRINGER didn't cut any corners. They custom-design and build their transducers from scratch. Not only do they wind their own voice coils, they process the paper pulp into cones and even machine their own backplates. This enables BEHRINGER to control the quality and make better components, like the long-excursion LF transducers and state-of-the-art 1.35" compression drivers deployed in the B210D and each EUROLIVE D Series speaker enclosure. The EUROLIVE D Series speakers were built with extended low-frequency handling in mind. With a tuned port, internally braced, injection-molded enclosure, each model's custom-designed LF transducer (woofer) really cranks out tight low end. Even if your particular application doesn't include booming bass, you'll love the sheer accuracy of the EUROLIVE B210D. Over a year of design went into a exponential horn/aluminum dome compression driver combination that could do justice to loud hard rock or dance music-yet could also satisfy audiophiles with its musical timbre and attention to detail. For spoken word, singing, or acoustical instruments, the D Series loudspeakers are able to articulate complex harmonic details. Dynamic processing is one of the best ways to maximize output without sacrificing sound quality. The EUROLIVE B210D's built-in circuitry automatically adjusts program content, allowing the loudspeaker to operate at extreme levels. It accomplishes this by reducing bass output slightly as you approach the limit of the transducers. This frees up LF amp and transducer resources, so that higher overall volume can be realized. It's like having a tiny soundman inside each cabinet constantly monitoring and changing output parameters. By making subtle changes to the crossover frequency and the audio content, the system is able to crank out more sound‚Äîwithout the slightest hint of distortion. Cutting-edge technology and high-fidelity speakers are not all it takes to get your message across‚Äîyou need power, and lots of it. At the heart of each EUROLIVE B210D loudspeaker is two high-current amplifiers with a total output of 220-Watts. They're capable of driving the speakers to their maximum with no distortion-and without speaker damage, thanks to active internal protection circuits. Put simply, they will astound you with their massive punch, smooth mids, and articulate top end.